What is Free Download Manager 64-bit? It is a powerful, easy-to-use and absolutely free download accelerator and manager. Moreover, FDM is 100% safe, open-source software distributed under GPL license. In addition, Free Download Manager allows you to: adjust traffic usage; to organize and schedule downloads; download video from video sites; download whole web sites with HTML Spider; operate the program remotely, via the internet, and more! Download files using BitTorrent protocol. Create new downloads or view the list of active and completed downloads remotely, via the internet. If you want to use Free Download Manager 64-bit on different computers, you can easily create its portable version and avoid the need to install and configure the program on each computer. Free Download Manager splits files into several sections and downloads them simultaneously, allowing you to use any type of connection at the maximum available speed. With FDM download speed increases, or even more! When the downloading process is interrupted, you needn't start from the beginning again. Free Download Manager can resume broken download from where it was interrupted saving your time, nerves and money. Site Explorer lets you view the folders structure of a web site and easily download necessary files or folders. You can download whole web pages or even whole web sites with HTML Spider. The tool can be adjusted to download files with specified extensions only. Free Download Manager is able to download files from several mirrors simultaneously. Free Download Manager lets you download only the necessary part of a zip file. You can read what other community members say about the file you are going to download, right in the program window, and also leave your own opinion about the file you downloaded. In this way FDM users are always warned against useless or malicious files. 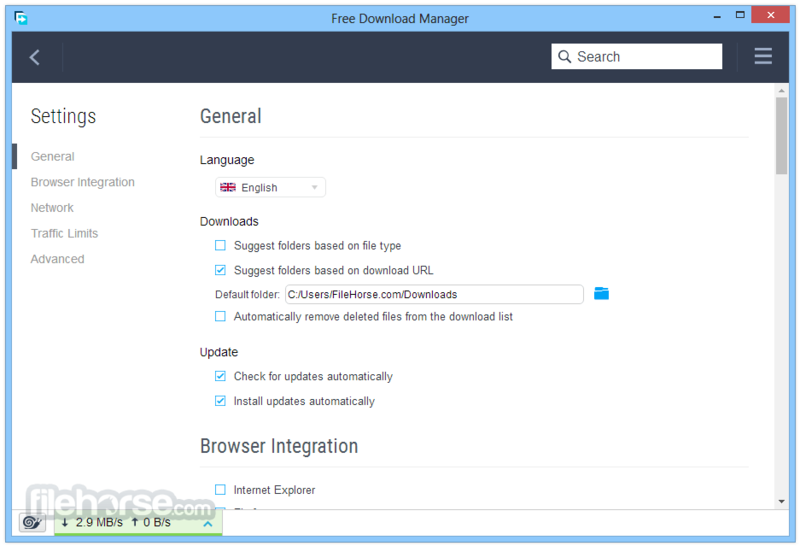 Free Download Manager is translated into 30 languages. Supported languages are: Macedonian, Serbian, Albanian, Croatian, Korean, Arabic, Brazilian Portuguese, Bulgarian, Chinese Traditional, Chinese, Czech, German, Dutch, French, Hebrew, Hungarian, Italian, Polish, Portuguese-Brazil, Romanian, Russian, Slovak, Spanish, Swedish, Turkish, Uzbek, Greek, Vietnamese, Slovenian, Persian.